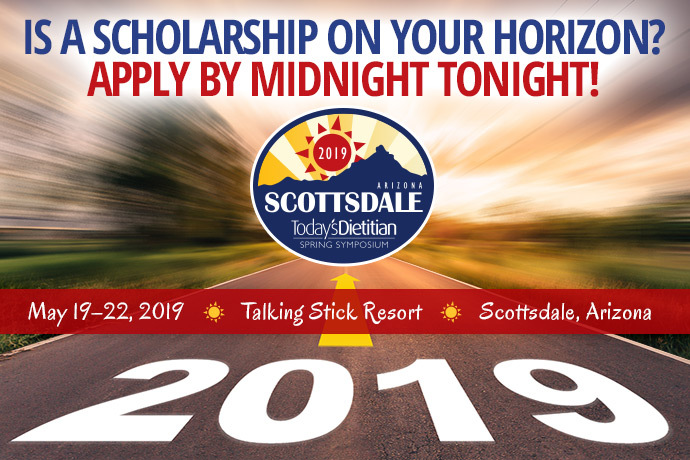 Today’s Dietitian is offering a limited number of scholarships for complimentary registration to our 2019 Spring Symposium in Scottsdale, Arizona, on May 19–22. We recognize the important role nutrition professionals play in our communities, so we want to make our one-of-a-kind continuing education event available to as many deserving nutrition professionals as possible. Valued at up to $499, this scholarship covers all registration costs* for the event including educational sessions and workshops led by respected experts, CEUs, and on-site opportunities to network with presenters and peers. The Talking Stick Resort in Scottsdale will be a breathtaking backdrop for our first-class presenters to deliver sessions ranging in topic from clinical nutrition, culinary perspectives, health, wellness & prevention, professional development, sustainability, community & policy and more. Applicants will be considered on a first come, first served basis through Friday, November 30, so be sure to apply at your earliest convenience for your best chance of acceptance! Recipients will be notified the first week in December. Visit TodaysDietitian.com/SS19 to apply before our November 30 deadline and check back for more information coming soon! * Scholarships do not include travel or accommodations. Recipients must book a non-refundable one-night stay (or two-night stay if sharing a room) at the Talking Stick Resort in Scottsdale in order to secure their scholarship.